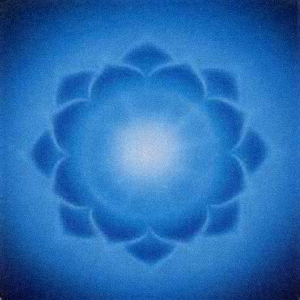 The word chakra is a Sanskrit term meaning “wheel”, for chakras are seen as spinning wheels of light by those with the ability to see subtle energy. There are seven main chakras that are located centrally in the front and the posterior of the body. This work is a representation of the fifth chakra, vishuddhi, located at the throat, and is associated with the process of communication, speech, and hearing. Peace, health, and happiness to you and all the company that you keep. Gus looks adorable! I hope to see you before the end of September. Would love to see you too! I’ll reach out by then and see what’s up with you.